What is GluNEO Lite Glucose Meter? A device used for blood sugar monitoring both in home care or hospital setting. Where is it manufactured? GluNEO Lite is manufactured by Infopia Co., Ltd. in South Korea. How does it work? The GluNEO Lite meter requires a small amount (0.5uL) of fresh blood sample to be applied to the GluNEO Lite Test Strip upon indication of the meter. How long will it take to get my results? It will take 5 seconds for the meter to read the blood glucose levels. What is the power source of the GluNEO Lite Meter? The meter is battery powered, with battery type 3V Li Battery (CR2032). How long is the will the battery last? Battery life is usually 3-6 months, depending on the usage. Where can I find GluNEO Lite meters and strips? Currently, the GluNEO Lite meters and blood glucose strips are available in all The Diabetes Store branches and select MedExpress branches. Is there a warranty? Yes, the GluNEO Lite Glucose Meter has a lifetime warranty. How do I avail of the warranty? 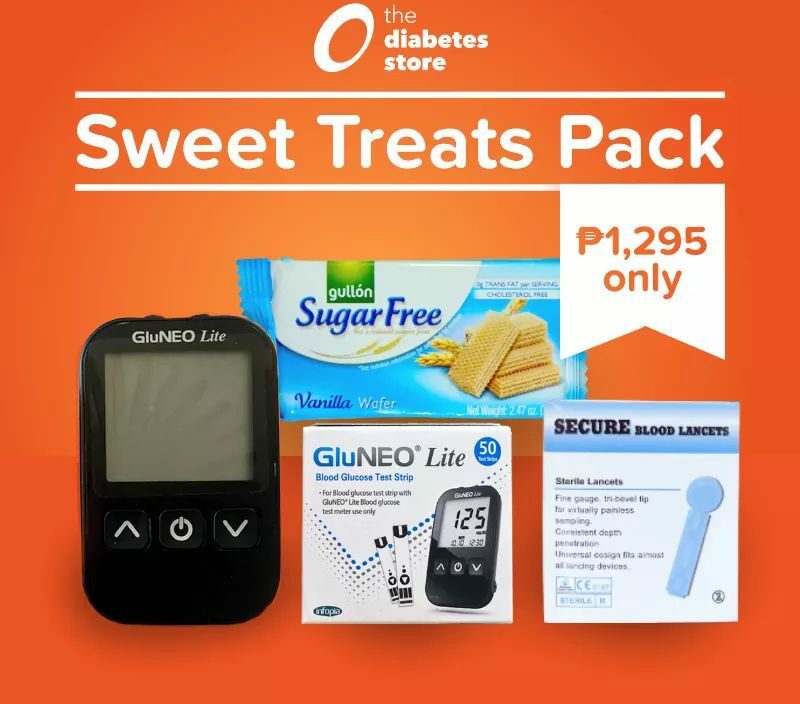 You can avail the warranty by bringing your broken or defective GluNEO Lite Glucose Meter to one of The Diabetes Store branches near you. Our engineers will check on your brought in meter and will replace it when necessary. Are the accessories, such as the lancing device and the battery, included in the warranty? The Lifetime warranty only covers the GluNEO Lite Glucose Meter. Can I use a Senior/PWD ID to avail a discount? Yes, simply present your Senior/PWD IDs prior payment. However, Senior/PWD discounts are not applicable for GluNEO Lite Promos. Where and how do I store the GluNEO Lite meters and strips? Keep your GluNEO Lite meters and strips in a cool and dry place, away from direct sunlight and heat. Do not freeze. Avoid dropping and strong impact. Always store and transport the meter and strips in its carrying case/pouch. What is the proper disposal and handling of the used strips and lancets? When handling anything with blood, observe universal precaution. Keep in mind that blood is considered infectious. Use the eject functions on both the GluNEO Lite Glucose Meter and lancing device to avoid blood contact. Discard of the used strips and lancets in a thick puncture-proof plastic container. Once the container is full, seal the plastic container before disposal. Do I have to purchase and use the GluNEO Lite blood glucose strips with the same codes every time? No. The GluNEO Lite meter has an auto-coding feature which means that you can use GluNEO Lite strips even if it has a different code. How do I clean my GluNEO Lite Glucose Meter? A cloth dampened with water and mild detergent can be used to wipe down the outer part of the meter. Avoid getting dirt, dust, blood, or any other liquids on the blood glucose test meter. What errors should I watch out for? You may refer to page 39 your manual for common errors and trouble shooting. How will I know when my meter is out of battery? “CHK” will appear on the lower left of the monitor with a battery sign blinking on the upper left. Is GluNEO Lite Glucose Meter durable? Yes. 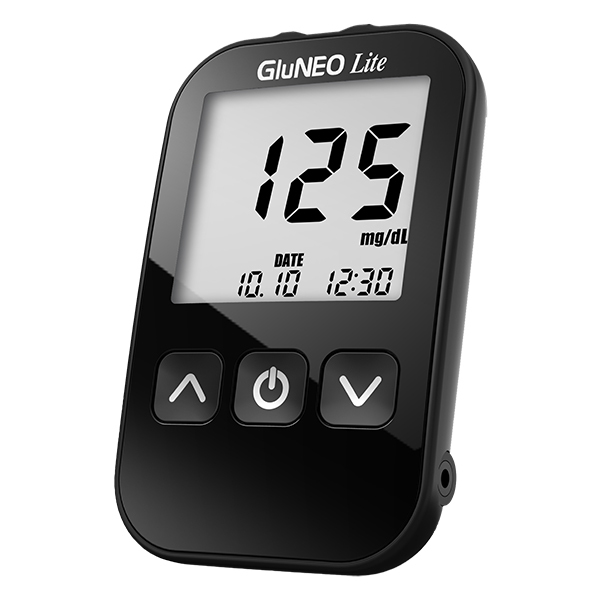 The GluNEO Lite glucose meter is durable with proper care and storage. Does the GluNEO Lite Glucose Meter store results? Yes, GluNEO Lite Glucose Meter can store up to 365results with date and time of blood sample collection. Are the results in hundreds(mg/dL) or in single digits(mmoL)? The unit of measurement may be adjusted to hundreds(mg/dL) or single digits (mmoL) depending on user preference. Where can I see the date and time of the blood sugar reading? The display on the lower part of the screen indicates the details of blood sample collection. How long before GluNEO Lite Glucose Test Strips expire? The expiration date is indicated on each cannister. However, once the seal is broken or the cannister is opened the strip potency will decrease to 3-6mos depending on storage. Starting May 10, 2018, The Diabetes Store will be providing physician consultations for diabetes at its Alabang Branch every Thursday from 9am to 6pm. And as an introductory offer, consultations will be FREE until June 7, 2018. Schedule a consultation today for you or you loved ones at (02) 821-1423. 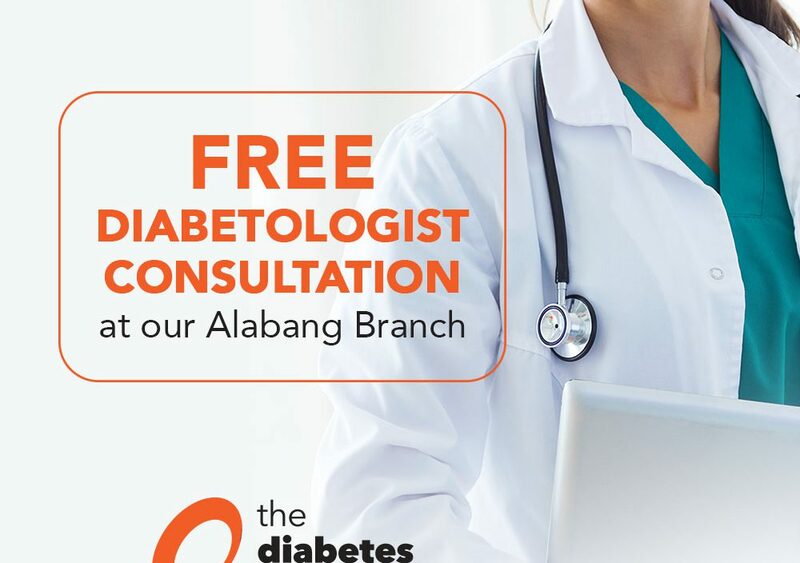 The Diabetes Store Alabang Branch is located at G/F HealthFirst Clinic, South Supermarket, Filinvest Avenue, Alabang, Muntinlupa City, Metro Manila. See you there! 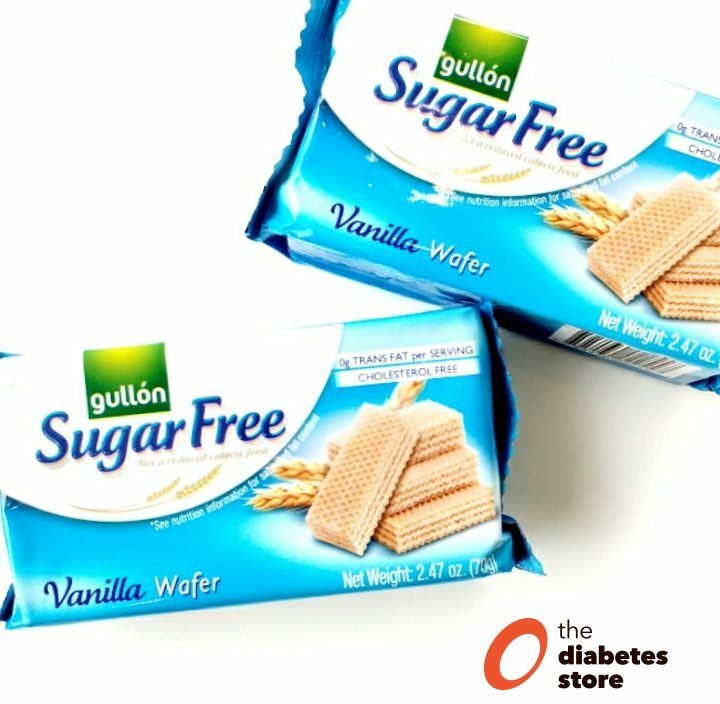 BUY 2 WAFERS FOR ONLY 100PH!